Christian preaching always confronts men and women with the biggest and the greatest and the most important thing in life. There are probably meetings being held in this country and in other countries at this moment to consider other matters, and they are all of importance. Alas, there are some holding political meetings tonight, and they are considering the present world crisis, the present situation. There are others who are met together to have cultural discussions about art and literature and music. There are things like that and, again, they have their importance. They should not be doing such things on a Sunday – though that is not my point at the moment – but they do these things on weekdays also. But the whole message of the Bible is that while all those things have their place and their importance, there is nothing which compares in importance with this – a man or woman’s relationship to God. Because, after this world has gone and passed away, we shall still be face to face with God. Whether there is a war, or whether there is not, whether an international arrangement and agreement are possible or not; still the soul remains and God remains and there we are, face to face with Him. In life in this world, nothing matters but our relationship with God. So it follows from that, obviously, that the next important thing is that we should know the truth about God. If the biggest thing for me is my relationship to God, then I want to know the truth about Him. And here the Psalmist tells us about it. We have considered one aspect of it, which is that God is righteous, and just, and holy, and that there is no end to His might and to His power. God is the judge eternal, whom no one can evade and no one can escape; the judge of all the earth, God the almighty. So the Psalmist’s object is to enlighten us about these things; but, thank God, he does not stop there. He then goes on to tell us something about God as our Saviour – the salvation of God. Did you notice the alternation in this last passage – first one side, then the other? God’s salvation first. 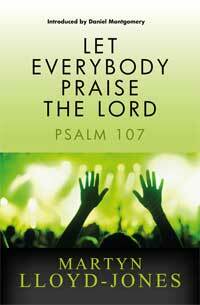 He began by saying, ‘Oh that men would praise the LORD for his goodness’ (v. 31). But why don’t they? Well, generally, because they do not understand this salvation of His. Did you know that? I ask again, are you praising God? Are you thanking Him? Is there a song of praise and of thanksgiving in your heart? Are you ready to join this man’s great choir that He is assembling together from the east and from the west, from the north and from the south, to sing the praises of God? Or do you say, ‘I am not conscious of a sense of praise and of thanksgiving. I don’t want to thank God; I don’t see any reason for thanking him. I am finding life very difficult and the world very difficult. Thanking God! My attitude is this: if there is a God, well, why are things as they are? And why is he allowing things to be as they are? I cannot praise God. I am not conscious of his goodness.’ Now if that is the position, it is because somewhere or another you do not understand God’s way of salvation and you have got wrong ideas about it. So let us get our minds disabused of these erroneous conceptions and look at it as it is unfolded and expounded to us by the Psalmist in this concluding section of Psalm 107. What are the characteristics of this salvation that God gives to men and women? The first thing is that it is a complete reversal of all our natural ideas. I always like to start with that principle as I preach this gospel. The gospel of our Lord and Saviour Jesus Christ reverses all our human, our natural ideas. It turns them literally upside down. There is nothing else in the world like it. Now there are many people who obviously do not agree with that, because they betray themselves in the things they say. They talk about ‘great religious teachers’ and ‘great religious geniuses’. They bring out their lists. They talk about Moses and Jeremiah, and they talk about Buddha, and Confucius, and the Christ, and others. And by saying that, they are at once telling us that they have never understood the first thing about the Christian way of salvation, which is its uniqueness. It is not a philosophy in series with a whole host of other philosophies, nor it is just a teaching like others. It is entirely different and it is entirely on its own. This is how the Psalmist puts it: ‘He turneth the wilderness into a standing water, and dry ground into watersprings’ (v. 35). Is that the sort of thing we find happening in the world? Do you suddenly turn around a corner and find a wilderness becoming standing water and dry barren ground suddenly springing up? ‘Ah,’ says somebody, ‘life is not like that, you know. You get that sort of thing in the fairy tales and in the fantasies, but that is not life. Life is hard; it is a grind; it is cruel, and you do not suddenly get these amazing reversals and surprises.’ That is the natural man or woman’s thinking about God’s way of salvation. But the whole of the New Testament gives us the exact opposite impression. It starts like this. A priest goes into the temple to do his duty and suddenly he sees an angel. He is not expecting it, but there an angel suddenly appears and says to him, ‘Zacharias, you and your wife Elisabeth are going to have a child.’ ‘It is impossible!’ says the man. ‘Don’t you know how old we are? This thing cannot take place.’ But that was the announcement, and it did take place. And so it continues. Do you remember the angel going to Mary and talking to her about that ‘holy thing’ that would be born out of her? She says, ‘How can this thing be? I have never known a man.’ Nevertheless, it was to be and it did happen. You see, we are in a realm which is altogether different. It is not like anything else. This is what the Christian gospel claims, and the tragedy is that we all start with the other idea and the other prejudice, that Christianity is just a higher form of morality, a morality ‘touched with emotion’ as Matthew Arnold put it. We say that it really depends upon what we do, and so on, and we are not expecting this kind of thing. But this is the gospel; the reversal of all our thinking and all our ideas. man. You read this psalm and you say that that, of course, is typical of the poets with their imagery and their hyperbole, their vivid imaginations. They like playing with ideas, but it is all poetry. But this is not poetry; this is fact! You find the apostle Paul putting this in his own particular way in his various epistles in the New Testament. He says, ‘The natural man receiveth not the things of the Spirit of God: for they are foolishness unto him’ (1 Cor. 2:14). When the Greeks were confronted with this gospel, they laughed at it, they dismissed it. They said, ‘Fancy asking us to believe something like that! That a carpenter – in a little land like Palestine, of all places – is the Saviour, and that he saves not by propounding a great new philosophic system, but by being crucified in utter weakness upon a cross on a hill called Calvary! Rubbish and nonsense! Sheer folly!’ That is what they said; and they said it because it was such a reversal of all they had ever thought and imagined. But the gospel of Jesus Christ is surprising, and if it does not come to us as a surprise, we have really never known it. Indeed, if you have never felt about the gospel that there is something almost incredible about it, you do not have the real thing. It is something that is a counter to human ideas and appears to be utter fancy and fantasy and foolishness. My first principle, therefore, is that the gospel – this way of salvation – demands nothing of us at all. It tells us that we are in a state of barrenness, we are as dry ground, a wilderness, and we are in a state of extreme poverty. That is the New Testament doctrine. The New Testament comes to us and tells us that we are born into the world in a state of sin, and that we aggravate it and increase it and bring ourselves to this condition of complete barrenness, spiritual barrenness, spiritual poverty. It tells us that we are penniless and helpless and that we have nothing whatsoever. Now if you do not agree with that, let me prove it to you. Would you like to know how much you have by way of spiritual possession? Well, test yourself by this: ‘Thou shalt love the Lord thy God with all thy heart, and with all thy soul, and with all thy strength, and with all thy mind; and thy neighbour as thyself’ (Luke 10:27). Are we doing that? That is the way to test this yourself. Then, test yourself in terms of love, joy, peace, longsuffering, goodness, meekness, gentleness, faith, temperance. How much of these fruits do we possess and are we producing? That is the way to face it. So the Bible tells us that we are in this state of barrenness, but – and this is the astounding thing – it also tells that this makes no difference at all. God demands nothing of us but the recognition of that. He does not demand goodness of us, nor does He demand morality or works. He does not demand of us right ideas and wonderful conceptions of life and understanding. He makes no such demand at all. And the wonderful thing is that our lack of these things and our extreme poverty are no hindrance whatsoever. But this, surely, is the very point at which we all, by nature, tend to go astray. We all tend to think that becoming a Christian and sharing in the Christian salvation is something that is the result of our goodness, or our morality, or our working, or fasting or praying, or sweating, or something like that. We say, ‘I am going to make myself a Christian. By my own efforts I am going to make myself a good man or woman.’ But the gospel confronts us with the exact opposite. It says, ‘All our righteousnesses are as filthy rags’ (Isa. 64:6). All the things of which even a Saul of Tarsus can boast are nothing but dung and loss and refuse (Phil. 3:8). So the man who thinks himself the most wealthy, when he confronts this, is proved to be a pauper. He has nothing at all: wilderness, barrenness, extreme poverty and helplessness. could not find the way; the man in the prison cell could not break the bars of iron and smash the gates of brass; the man dying on the sick bed could not suddenly rejuvenate and revivify himself; and no human being can quell a storm at sea. No, no, they were utterly, absolutely helpless. All they did was to cry out in their distress. That is the Old Testament way of putting it, but do you remember how Christ Himself, our blessed Lord and Saviour, puts it? He says, ‘I am not come to call the righteous, but sinners to repentance’ (Matt. 9:13). ‘They that be whole need not a physician, but they that are sick’ (Matt. 9:12). He was the ‘friend of publicans and sinners’ (Luke 7:34). His whole trouble, indeed, was with people like the Pharisees who said, ‘No, no, you are wrong. What makes a man right with God is his own efforts and striving, and it is our righteousness that will put us right with God.’ But our Lord was saying the exact opposite, and they so hated Him for saying it that they crucified Him. Is to feel your need of Him. Wash me, Saviour, or I die. that we go to Him and say, ‘I have no defence, I have no plea of mitigation to offer. I have nothing to say except this: have mercy upon me!’ Repentance: that is all He demands. He turneth rivers into a wilderness, and the watersprings into dry ground ... He turneth the wilderness into a standing water, and dry ground into watersprings. And there he maketh the hungry to dwell, that they may prepare a city for habitation ... He blesseth them also, so that they are multiplied greatly ... Again, they are minished and brought low ... He poureth contempt upon princes ... Yet setteth he the poor on high from affliction, and maketh him families like a flock. It is God all along, and you see this everywhere in the Scriptures. You cannot get away from it. Listen to Paul putting it in his own words: ‘I am not ashamed,’ he says, ‘of the gospel of Christ’. Why? Well, here is the answer: ‘It is the power of God unto salvation to everyone that believeth’ (Rom. 1:16). And Paul works this out and shows how God reverses the whole conception of men and women and turns all our systems completely upside down in every respect and to every degree. He tells us that God has made foolish the wisdom of men. In that same chapter, he says, ‘But God hath chosen the foolish things of the world to confound the things that are mighty; and base things of the world, and things which are despised, hath God chosen, yea, and things which are not, to bring to nought things that are’ (1 Cor. 1:27-28). That is the gospel. Then again, in 2 Corinthians 5, Paul says, God has committed to me this gospel, this message of reconciliation. What is it? ‘To wit, that God was in Christ, reconciling the world unto himself, not imputing their trespasses unto them’ (v. 19). It is God doing it. It is God’s action. We start with this opposite idea that we must do something and the answer is, No, no; God does it! Who can turn a wilderness into standing water but God? Who can turn this dry ground into watersprings but the Lord God Almighty? But He has done it. And He has done it in and through our Lord and Saviour Jesus Christ. And that is the very essence of the gospel message. It is portrayed before us in the Communion Service by means of bread and of wine, which represent the broken body and the shed blood of the only begotten Son of God. That is how God does it. He sent Him into the world; the incarnation is God’s action. He sent His Son and prepared Him a body. It was a miracle. The Holy Ghost came upon Mary; it was a virgin birth. That was God’s way of doing it. He has done it in this person, and He has even gone to the extent of ‘laying upon him the iniquity of us all’ (Isa. 53:6). He has put your sins and mine and our guilt upon the person of His only begotten Son. ‘He hath made him to be sin for us, who knew no sin; that we might become the righteousness of God in him’ (2 Cor. 5:21). It is God’s action. Look at Calvary and there you see it. What is happening there? Oh, it is not merely that certain cruel men have condemned the Son of God to death. The Pharisees and scribes and the Roman power were but the human instruments. That is not what is happening there. Calvary is not just a human tragedy. It is not just that men have done a certain thing. No, no! It is an eternal action. It is something that God is doing. God has ‘made him to be sin for us’. He has ‘laid on him the iniquity of us all’. ‘With his stripes we are healed’ (Isa. 53:5, 6). And the Son was taking our sins upon Himself in His own body on the tree. That is what is happening there. It is God. ‘He turneth the wilderness into a standing water, and dry ground into watersprings’ (v. 35). All along, from beginning to end, it is this mighty action of God. forgives us for one reason only, and that is that He has punished our sins in the person of His own Son. It is not our pleading. It is not our repentance. It is not our works. Salvation is a free gift. That is why you can receive it now at any moment. That is why you need never wait or tarry. It is no use saying, ‘Well now, I am rather interested in this. I can see that I am a sinner, and I want to go to heaven, I want to be a Christian. I am going to decide, therefore, that I will ...’ Not at all, my friend! The moment you say that, you have gone wrong. You just come as a pauper, and you receive the free gift of God. It was all done nearly two thousand long years ago in that amazing transaction on the cross on Calvary’s hill. The perfect, complete, full salvation was prepared there, because I hear the Son of God saying – have you heard him saying it? – ‘It is finished.’ Everything that was necessary to save you and me – I mean by that, to get rid of our guilt, to blot out our sins, to reconcile us to God, to make us children of God – everything that was necessary for that was done there. It has all been done. It was done before you were ever born into this world. There is nothing left for you to do except to believe and to see that it was done there and to receive the free gift of salvation. You see what a complete reversal it is of everything we have ever thought. But this is God’s way. This is the Christian salvation. This is what Martin Luther came to see. He became the man he was simply because he saw one thing, and it was this very thing to which I have been calling your attention. There was that excellent young man who wanted to be godly, that young man who wanted to know God; so he became a monk. And you look at him in his cell: there he was fasting, believing that that would help him; doing good deeds and giving alms; studying the Scriptures; trying to perfect himself; trying to put himself right with God; taking his sacraments, believing, as his church had taught him, that grace came materially in and through the sacraments, that as he ate the bread he was eating the very body of the Son of God. He believed that all this would put grace into him mechanically, inject it into him as it were. He was doing all these things, and yet he remained miserable and unhappy and sad and ill at ease. He followed all the other methods. But you remember the story. Suddenly, in reading the Scriptures, he saw how wrong it all was, and this phrase flashed upon his soul, the Holy Spirit opened his mind to see it: ‘The just shall live by faith’ (Rom. 1:17). He saw that he had nothing to do, that it had all been done, that he had but to receive it. Christ has done everything. He need kill himself no more. Christ had been killed and, there, it had come to him as a free gift of God. And do you remember what happened? He began to sing. He had not been singing before. If you try to fit yourself to meet God you will not have much time for singing. You will be so conscious of failure that you will go for the rest of your life mourning. But the moment Luther saw this he began to sing. He began to rejoice. He said, ‘Oh that men would praise the LORD for his goodness, and for his wonderful works to the children of men!’ (v. 8). ‘I was a barren wilderness; nothing grew in me; my soul was empty and void; but now watersprings are bubbling up.’ And he began to write his great hymns, the verses and the tunes, and the whole Reformation followed, and all began to sing with him. It was just through seeing this truth, that salvation desiderates and postulates nothing in us except that we see and recognize and confess our barrenness, our emptiness and our woe. That we cry out to the Lord in our distress, and that we discover that He has done everything that is needed to be done in His only begotten Son in order to deliver us. Full salvation; free salvation; all in Christ. Sinners Jesus came to call. Just turn to Him, cry out unto Him, and He will answer and reveal to you the full provision even in our Lord and Saviour Jesus Christ. And then you will be ready and glad and eager to receive the invitation of the Psalmist who says, ‘Let the redeemed of the LORD say so’ (v. 2). ‘Oh that men would praise the LORD for his goodness, and for his wonderful works to the children of men!’ (v. 8). Yes, the most wonderful work of all: the work upon the cross.